Before last week, I’d never spatchcocked anything. Not a turkey, nor a chicken, but I did know that this technique that is a nice way of saying “removing the backbone and laying the bird flat” is always a winning recipe. 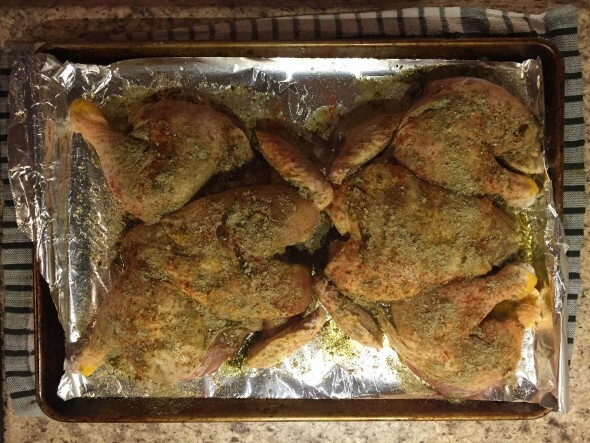 By laying the bird flat, it cooks evenly and stays moist. Even the breast. 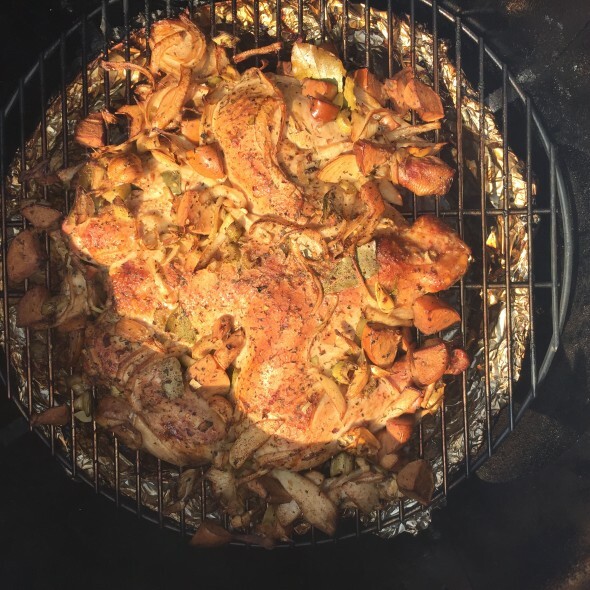 A spatchcocked, or butterflied, chicken cooks very well on the grill or in the oven and if you’ve ever heard of people referring to Brick Chicken, it’s a spatchcocked bird that has cooked under a foil-wrapped brick for an even quicker cooking time. Now, this fancy word sounds like it’s a technique for the masters. Let me tell you, it’s not. 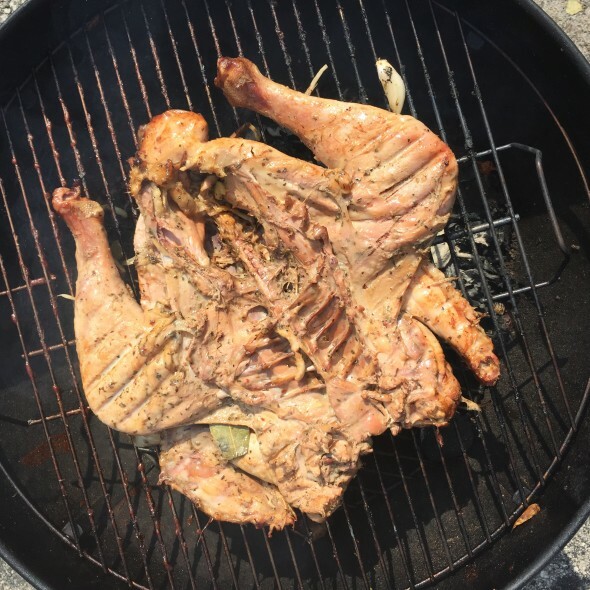 I know this because since submitting our spatchcocked turkey at the Kansas City Kosher BBQ Festival on Sunday (and placing fifth), this has become my go-to method of roasting poultry. 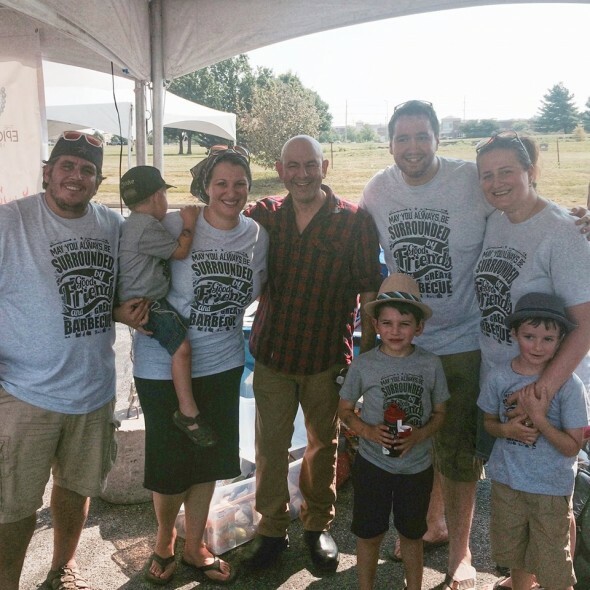 Smoked spatchcocked turkey at the Kansas City Kosher BBQ Festival – Team Epicurean Bite. And here’s the other side of our Spatchcocked smoked turkey. The bird is covered in onions and garlic from our 36 hour French brine. 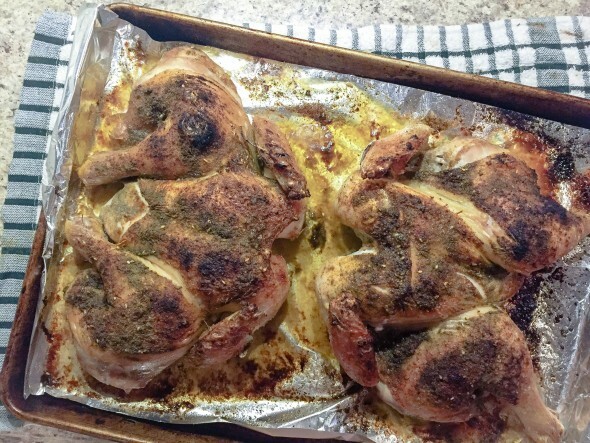 To prove that this isn’t just a competition technique, I defrosted two of the delicious organic chickens that KOL Foods sent me and I made the perfect roast chicken dinner in about 45 minutes. 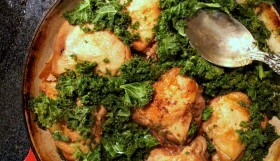 KOL Foods are, in my humble opinion, the go-to company for all your organic chicken and meat. Not only are they raising animals without pesticides and with organic feed, their entire operation is socially responsible. Their facilities are LEED certified and they pay their farmers a livable wage. 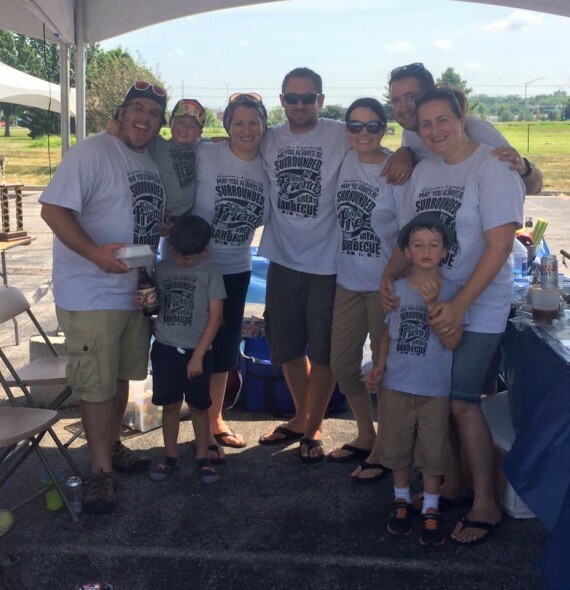 I’ve written about KOL Foods a number of times and I am very public about my admiration for this company and as always, it’s an honor to work with them to bring you this post. 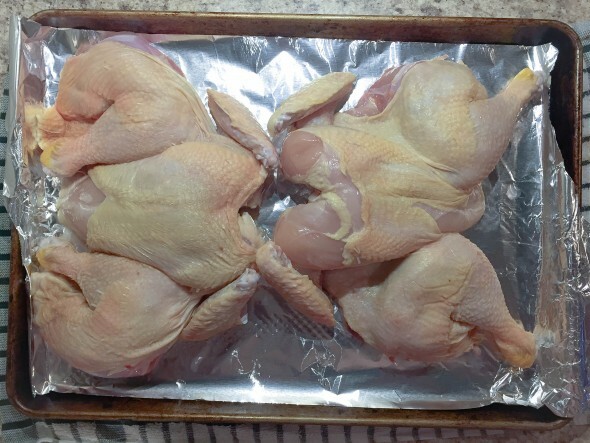 STEP 1: If your chicken is frozen, defrost it in the freezer overnight. Once it’s defrosted, pat it dry with a towel to remove any excess moisture. This will help you get a crispy skin when you roast or grill it. 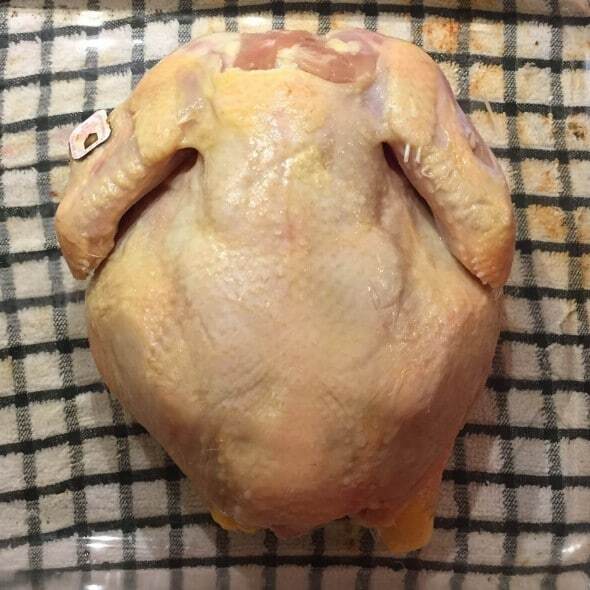 Lay the chicken on it’s breast. STEP 2: By putting your fingers inside the cavity, feel for the edge of the backbone. Cut along one side of the backbone, all the way across the chicken. Repeat for the second side of the backbone. Store the backbone and the neck for making soup or stock another time. Step 3: Turn the bird over and use the palm of your hand to put pressure on the chicken breast to flatten the bird. Don’t worry if you hear bones crack. That’s a good thing. 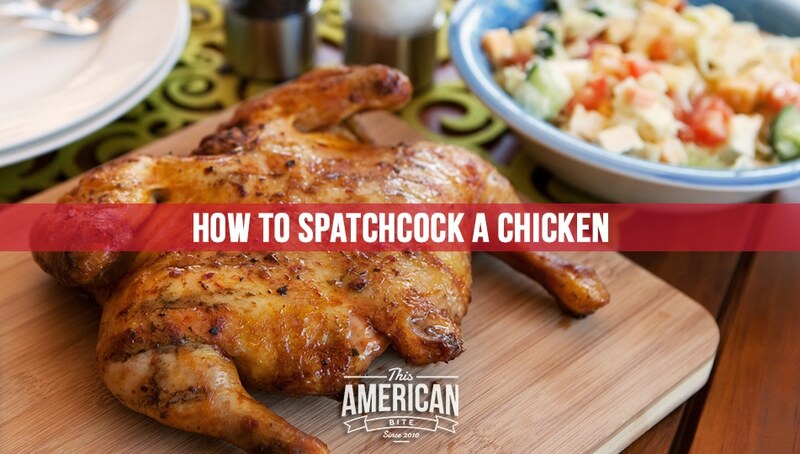 It means your chicken is laying flat and even. Now that your chicken is flat on your baking tray, you can brine it for 24 hours (which is an excellent idea!) or simply season it with your favorite family recipe before roasting it at 450 degrees for 40 minutes. This time, I used a garlic and zaatar blend which I applied to the chicken after drizzling it with a little chipotle infused olive oil. Check the internal temperature of the chicken after 30 minutes. 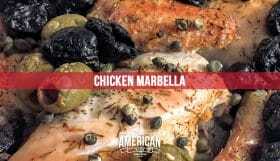 When cooking a chicken evenly and at a higher temperature, it will roast quickly and you don’t want an overdone chicken. No one wants that. Once your meat thermometer is reading 165 at the thickest point of the chicken then you’re ready to take the chicken out of the oven. 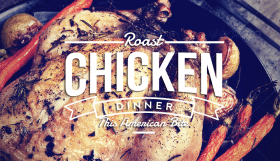 As you would with a roast or a steak, please let your chicken rest for ten minutes before carving it. All those yummy juices and flavors will be absorbed into the chicken if you give it a few minutes. 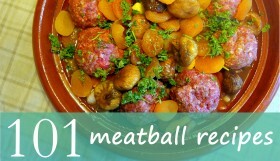 I’ve served this with roasted butternut and polenta, or alongside basmati rice and dhal. Now it’s your turn, leave me a comment and let me know what your secret is to the perfectly roasted chicken.